Massachusetts residents are fortunate to have a generous weatherization subsidy program provided by sponsors of the Mass Save Program. You can learn more about it here: https://www.masssave.com/en/saving/residential-rebates/heat-loan-program. Financial assistance for vermiculite abatement is also available for a limited time to eligible participants through the Program. These grants (up to $3,000) are delivered through the Expanded HEAT Loan and are brought to Massachusetts homeowners by the Massachusetts Department of Energy Resources with a $3.8 million grant from the U.S. Department of Energy. To the extent a homeowner has unreimbursed costs after maximizing the benefit provided by this program, the ZAI Trust may be able to offer additional assistance. Your ZAI claim form should fully disclose and document the participation in the Expanded HEAT Loan offering (Mass Save). 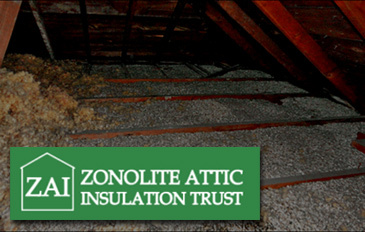 Washington State Department of Health Resources on Asbestos in Vermiculite Insulation.